His lecture will focus on the potential for and limitations of national politics in meeting global challenges and the role of the individual in current global crises. Dr. Koehler’s lecture will draw from his broad experience as the head of international institutions, as the President of Germany, and as a still-active citizen. Dr. Koehler was recently appointed Personal Envoy for Western Sahara by the United Nations Secretary-General; he also served as Managing Director of the International Monetary Fund (IMF) from 2000 to 2004.
offering a major lecture entitled , “Citizenship in a Global Age: Personal Reflections on a Political Conundrum” in which he will draw from his broad experience as the head of international institutions, as the President of Germany, and as a still-active citizen. Dr. Koehler’s visit is sponsored by the Nanovic Institute for European Studies and the Notre Dame Institute for Advanced Study with additional support from the College of Arts and Letters, the Department of Economics, the Department of German and Russian Languages and Literatures, the Keough School of Global Affairs, the Harper Cancer Research Institute, the Mendoza College of Business, and Notre Dame Research. 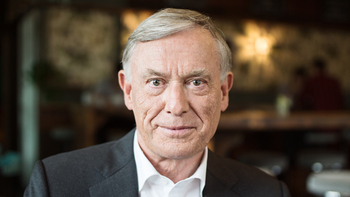 Dr. Horst Koehler was elected July 4, 2004 as the ninth President of the Federal Republic of Germany and served from 2004 to 2010. As president of the German nation, Dr. Koehler pushed for a better national education system and for a creative approach to demographic change that would help to make the nation ready for the challenges of the 21st century. Believing Germany to be a “land of ideas” with the confidence and unity required to shape its own future, he proposed that the country shoulder its responsibility to be a force for good in the world, especially in the European Union. In the field of foreign policy, he advocated for a more humanistic dimension to globalization and clearly defined rules, campaigning staunchly in favor of poverty eradication and for a more intensive partnership of Europe with the African continent. On May 23, 2009, President Koehler was re-elected for a second term of five years. On May 31, 2010, he resigned from the office of federal president. Prior to his serving as president, Dr. Koehler earned his doctorate in economics and political sciences from the University of Tübingen, where he was a scientific research assistant at the Institute for Applied Economic Research from 1969 to 1976. After completing his education, he held various positions in Germany’s Ministries of Economics and Finance between 1976 and 1989. In 1990, Dr. Koehler was appointed state secretary in the Ministry of Finance. In this role, Dr. Koehler negotiated the German monetary union with the German Democratic Republic (GDR), also known as East Germany. He also negotiated the withdrawal of Soviet troops from the GDR and served as chief negotiator for the Maastricht Treaty on the European Monetary Union and as the personal representative of Federal Chancellor Helmut Kohl for the World Economic Summits. In 1998, Dr. Koehler was named president of the European Bank for Reconstruction and Development in London, an institution charged with building up the market economy and democracy in the former Eastern Bloc states. In 2000, Dr. Koehler was appointed as new managing director of the International Monetary Fund (IMF) in Washington, D.C. In this role, he led efforts to resolve financial crises in a number of countries. In addition, he focused the Fund’s attention on debt relief for the poorest countries and on ensuring the macroeconomic stability of African countries. Following his departure from the German presidency, Dr. Koehler has continued to serve in a number of honorary positions both in Germany and internationally. From 2012 to 2013, he served on the Post-2015 Development Agenda, the international advisory board established by United Nations Secretary-General Ban Ki-moon to study the global development framework and to develop a global development agenda beyond 2015, the target date for the Millennium Development Goals. From 2016-2017, he co-chaired, together with Kofi Annan, a Special Panel of the African Development Bank on the Bank’s new strategic priorities. In 2017, Dr. Koehler was appointed by United Nations Secretary-General António Guterres as his Personal Envoy for Western Sahara. Dr. Koehler speaks frequently on issues of international politics and was awarded with a number of prizes for his leadership in the fields of sustainability, economy and international development. Eva Luise Koehler is the former First Lady of Germany and Patroness of the German Alliance for Rare Diseases (ACHSE), a position of leadership and service she has held since 2005. She is also chair of the supervisory board of the Eva Luise and Horst Koehler Foundation for People with Rare Diseases. Mrs. Koehler advocates on behalf of the needs and interests of rare disease patients and, through her foundation, promotes increased research on orphan drugs and the treatment of rare diseases. From 1969 to 1977 Mrs. Koehler taught at special schools for children and young people with learning difficulties in Winnenden and Herrenberg. She has also taught at primary schools in Bonn.